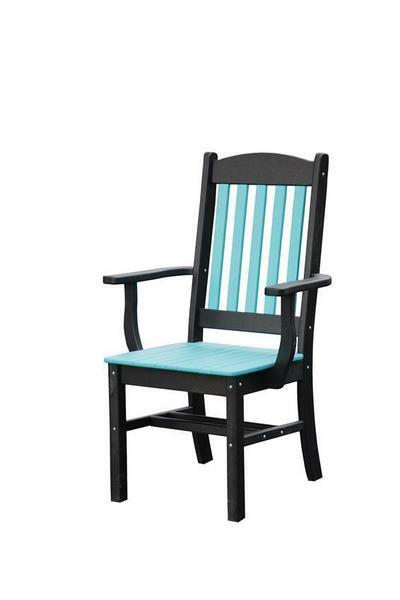 DutchCrafters' Sunnyside Poly Outdoor Arm Dining Chair with arms is the perfect captain's chair! Place a few of these around your outdoor dining table so you can fit your entire family around the table for dinner. Although labeled as a dining chair, the Sunnyside Poly Outdoor Arm Dining Chair can be utilized as a great spot for leisure after a big meal outside. Customize the look of our Poly Outdoor Dining Chair by selecting from our wide variety of poly colors. If you have any questions on our outdoor Amish furniture please call us toll-free at 1-866-272-6773. Assembled shipping is available. Please call for a quote. Not all products can be made entirely of wood grain color. Please call a furniture specialist with any questions.